Ever since the .308's introduction, it has been a favorite parent case for wild-cat cartridges, and the "6.5mm-08" has been around in custom chamberings for decades. In 1997, due to Jim Carmichel's efforts, Remington commercialized the .308 case necked to 6.5 mm in the .260 Remington, intended as a flat-shooting, low-recoil short-action cartridge for medium game. The .260 Remington can be thought of as the American version of the 6.5x55 Swede, but it fits in a short action and can be loaded to 2.800 inches. The .260 Remington cartridge is gaining favor with many long-range shooters for the simple reason that it slings the long, slim, high-BC 6.5mm bullets at respectable velocity. It duplicates or beats the .300 Winchester Magnum's trajectory with less recoil than .308. A rifle chambered in .260 Remington is easier to handle and has less recoil than the big magnums. This shooter engagines targets partially hidden by tall grass, making a prone position impossible. Compared to the venerable .300 Winchester Magnum's most common load - a 190-grain Sierra MatchKing at 2900 fps - the .260 has about 17% less wind drift and a few clicks less drop. Even though it shoots a 140-grain bullet, it still has 87% of the Magnum's energy at 1000 yards because its slim design yields a much higher ballistic coefficient (BC) value, so it retrains velocity longer. It also has 60% less recoil than the 300. The .260 Remington blows .308 out of the water. It has 35% less wind drift and about 10 MOA less drop at 1000 yards than the standard 175-grain M118LR load. Despite a 35-grain deficiency in bullet mass, it has 31% more energy because it loses less along the way due to atmospheric drag, hitting 350 fps faster at 1000 yards. For long-range use, the heavier, higher-BC bullets are always a good idea. In .260, this means using the 120 up to 142-grain match or VLD type bullets from Sierra, Lapua, or Berger. The 139-grain Lapua Scenar, 140-grain Berger VLD, and 142-grain Sierra MatchKing are the best choice for cutting through the wind and retaining down-range energy. These heavy 6.5 mm match bullets have BC values between 0.58 and 0.64, and can be shot at 2800-2850 fps from a 26-inch barrel. If you want a flatter trajectory and don't mind a little more wind drift, the 120-grain SMK and 123-grain Lapua Scenar are good choices, gaining about 175 fps over the 140-grain-class bullets. These 120-grain-class 6.5 mm match bullets have BC values between 0.51 and 0.55. The best the .308 Winchester can do is 0.508 at 2850-2900 fps (155-grain Lapua Scenar), or 0.631 at 2400-2500 fps (210-grain Berger VLD). 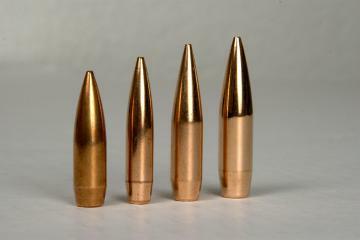 To match the BC of the 6.5 mm 139-grain Lapua Scenar (#2 from left, 0.615), the .30 caliber has to step up the 210-grain Berger VLD (#3 from left, 0.631). Also shown for comparison are the .30 caliber 175-grain Sierra MatchKing (left, 0.496) and the .338 caliber 250-grain Lapua Scenar (right, 0.675). The beauty of .260 is that it is a drop-in replacement in .308 rifles, providing a dramatic ballistic upgrade with only a barrel change. Since it is based on the .308 case, .260 cases can be formed easily by necking down .308 cases. Bolt-face size, feeding, and magazines are not affected. Screw a new barrel on your action, and you are ready to go. Certainly there are better long-range calibers, such as 6.5-284 Norma, 7 mm Remington Magnum, or .338 Lapua Magnum, but these require a larger action, different magazines, produce more recoil and will burn out barrels more quickly. For the .308 case, the 6.5 mm bore size is the sweet spot in terms of having bullets of high-enough BC value to perform at long-range while retaining decent muzzle velocity. Sounds ideal? Well, it's not all roses. Up until now, there haven't been any factory loads which use those high-BC bullets appropriate for long-range. As this is being written, Black Hills Ammunition, at the request of G.A. 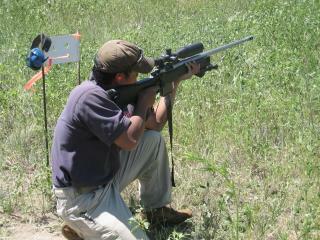 Precision, is working on a factory load using the 139-grain Lapua Scenar. When this comes to market, the .260 will be a much more viable choice for the long-range shooters who don't or can't reload their ammunition.